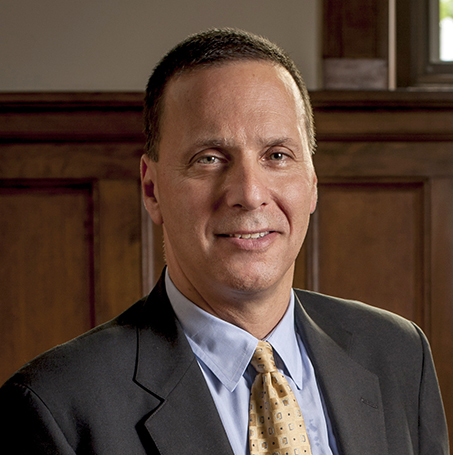 Ronald D. Liebowitz served as Middlebury’s 16th president from 2004 to 2015. Under his leadership, Middlebury expanded the range and depth of its academic programs and provided myriad opportunities for students to apply their educations in ways that prepare them to meet the global challenges of the 21st century. During Liebowitz’s presidency, Middlebury College invested in its faculty, its liberal arts curriculum, and its campus. It added 120 endowed student scholarships and 16 endowed faculty positions; sent two successful student teams to the U.S. Department of Energy’s Solar Decathlon competition (the first liberal arts college to do so); inaugurated the Franklin Environmental Center for the study of the environment and sustainability; created the Center for Social Entrepreneurship; and initiated an array of programs to help students acquire leadership and communication skills and to cultivate creativity and innovation. In 2007 Middlebury committed to making the campus carbon neutral by 2016 and in 2015 announced a gift and agreement that would preserve the Bread Loaf Campus in perpetuity. Liebowitz significantly expanded Middlebury’s global focus as well. In 2005 Middlebury affiliated with—and in 2010 officially acquired—the Middlebury Institute of International Studies at Monterey, a 700-student graduate school with leading programs in translation and interpretation, global policy studies, and nonproliferation and terrorism studies. The Middlebury Language Schools opened the School of Hebrew in 2008 and the School of Korean in 2015, increasing the number of Language Schools to 11. During Liebowitz’s presidency, the Middlebury C.V. Starr Schools Abroad added 23 new international sites bringing the total to 36 campuses in 16 countries. Many of these accomplishments took place against the backdrop of a deep economic crisis that began in 2007. Liebowitz guided Middlebury through that recession while maintaining a balanced budget, sustaining the institution’s commitment to need-blind admissions, and without resorting to layoffs. During his presidency, Middlebury benefitted from increases in annual fundraising and in the giving participation by alumni, which grew to one of the highest rates in the nation. In 2015 Middlebury successfully completed a $500 million fundraising initiative with a final total of $535 million in gifts. Liebowitz leveraged the institution’s resources to the benefit of the town of Middlebury by contributing to the cost of several significant infrastructure projects and by increasing annual payments in lieu of taxes. A native of New York City, Liebowitz graduated in 1979 from Bucknell University, where he majored in economics and geography and competed as a varsity swimmer. A specialist in Russian economic and political geography, he received his doctorate from Columbia University. Liebowitz also twice attended Middlebury’s Russian School before arriving at Middlebury. Liebowitz joined the faculty at Middlebury in 1984 and was promoted to associate professor in 1988 and full professor in 1993. He was appointed provost in 1997 and began his presidency in July 2004. In 2009 Time Magazine named Liebowitz one of the 10 best college presidents in the country. In 2014, the Bucknell Alumni Association honored him as the recipient of the “Outstanding Achievement in a Chosen Profession” award. Liebowitz became the ninth president of Brandeis University on July 1, 2016. He and his wife, Jessica, live in Newton, Massachusetts with their three children, David Heschel, Shoshana, and Ezra.